Despite the prevalence of these so-called perinatal common mental health disorders (PCMDs), they remain extremely underreported and undertreated. “We have a huge problem that has been kept under the carpet and it is just beginning to emerge,” said Dr. Ricardo Araya of the London School of Hygiene and Tropical Medicine at the Wilson Center on April 9. PCMDs can increase the risk of preterm birth and low birth weight, cause irregular behavior among new mothers, and even lead to suicide. Accounts of psychological disturbances in pregnant women and new mothers go back as early as the mid-19th century in European literature. While thousands of academic papers and other publications have documented evidence of PCMDs since then, social stigma has prevented more widespread awareness and treatment. It’s a “topic that has had to work hard to provide evidence about its fundamental importance to the health of women who are pregnant or who have recently given birth,” said Fisher. Suicide is a leading cause of maternal death in developed countries, but PCMDs are actually more common in lower- and middle-income countries, especially in rural areas, where support services are often unavailable, and amongst low-income women, who cannot afford sufficient nutrition or treatment regardless of its availability. “Mental health has been abandoned for years, for far too long,” Araya said. Of the total global health burden measured in years lived with a disability, mental health problems constitute the largest share with 23 percent. The significance of these costs are forcing policymakers to pay closer attention in recent years. Fisher’s research suggests a link between mental health and women’s empowerment. The status and treatment of women plays a formative role in their mental health, she said. The quality of a mother’s relationship with their intimate partner – including factors like whether the partner is polygamous, violent, alcoholic, or rejects the pregnancy – is key. In a systematic review of health studies in low- and lower-middle income countries, Fisher and colleagues found PCMDs were more likely to occur if the mother was an adolescent, if the pregnancy was unwanted, or if the baby was a girl. Conversely, women were much less likely to experience problems if they received an education, were employed and had child care, and maintained a healthy relationship with an intimate partner. He suggested integrating diagnosis and treatment of mental health problems into existing maternal health programs as a cost-effective means to deliver therapy to low-income women. In Santiago, Chile, Araya helped pilot a program that offered treatment to new mothers at an established primary care facility in conjunction with their regular, post-natal check-ups. Among women experiencing post-partum depression, 70 percent recovered after a six-month period of seeing a social worker. Among women who received the usual care, only 30 percent recovered during the same period. Still, delivering therapy proves a challenge when staffing runs short. Developing countries often suffer from an absence of qualified mental health workers. While high income countries can provide up to 10 psychiatrists, 14 psychologists, 15 social workers, and 32 psychiatric nurses per 100,000 people, less than one of any of these professionals are available in low and lower-middle income countries for the same population, said Araya. To overcome such disparities, Araya proposed “task-shifting” or “task-sharing.” After proper training and under supervision, certain responsibilities are redistributed from highly skilled professionals to general health care workers, giving nurses and others the ability to administer mental health therapy where social workers or other mental health professionals are not available. This is a controversial solution to some, Araya acknowledged, because people see mental health as different than other kinds of health care and have ethical concerns about treatment. In Brazil, Araya and his colleagues pioneered a program funded by the National Council for Scientific and Technological Development that offered support to depressed women by supervised primary care nurses. While government officials were hesitant to allow nurses without extensive psychiatric training to administer such therapy, initial results have proved positive, he said. Similarly, in Pakistan, “lady health workers” in rural villages were given further training to administer psychiatric care as part of a study by Atif Rahman, professor at the University of Liverpool. Following their sessions with women experiencing symptoms, 77 percent of participants recovered versus only 47 percent of women without treatment. Women are twice as likely to experience depression as men, said Araya but they are also more likely to disclose the problem and accept help. The program Araya initiated in Chile illustrates the impact of improved mental health care on women’s empowerment. Women who participated valued their experience so highly they were inspired to self-organize and continue to offer informal mental health services to other new and expectant mothers on a volunteer basis. Their group even expanded to organize social activities and launch a wellness program. The fact that most patients of primary care clinics are women, as are most primary care workers, may make replication of the Chilean model easier, especially as more women in developing countries enter the workforce. Both Fisher and Araya said they sense a change in perceptions about mental health generally and PCMDs specifically. In their experience, governments are becoming more willing to support mental health initiatives and there is a push for such programs to become more inclusive of women in the community in order to address mental disorders as a broader women’s issue and avoid stigma. “If our endeavors are framed in terms of women’s situations that contribute to this problem, it makes it a much more palatable, much more acceptable framework within which people might participate in getting some assistance,” said Fisher. Sources: The Lancet, World Health Organization. 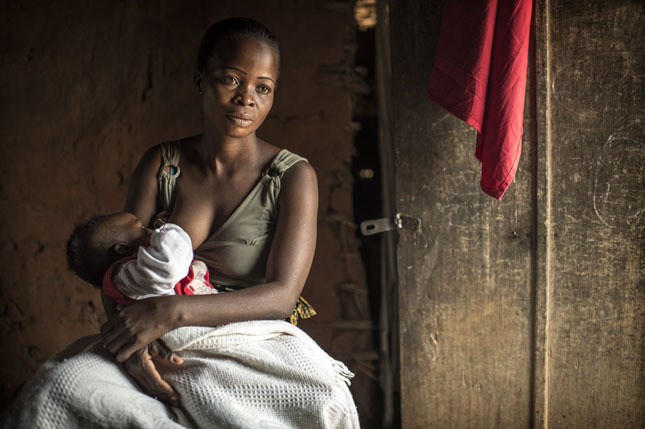 Photo Credit: Mother and child in Bandundu Province, Democratic Republic of Congo, courtesy of the H4+ Partnership. Strikingly there is no mention of midwives. Midwives are well placed to promote mental health, prevent PCMDs, detect and refer more serious problems. As Jane Fisher highlights, women’s empowerment is key. A psychological approach in isolation will not achieve the desired goal. Midwives are also well placed as advocates and able to build communities and enhance women’s social support networks … but some do not even see it as their remit and siloing of areas of health care is problematic. An interesting emphasis also on community development. Certainly midwives, but also maternal and child health nurses are well placed to promote support for women and their families after the birth of an infant but unfortunately there are far too few initiatives to support young families. This depends very much on where one lives – would love to see something development along these lines on a national scale (Australia) as is happening in places like Chine.